Lots of bonito flakes dancing atop the okonomiyaki, originally uploaded by Camemberu. Does this look like a mess? Well, it's a tasty mess. Combo dish of yakisoba (fried noodles) and okonomiyaki (the Kansai dish that defies definition - it's like a cabbage-omelette pancake with any myriad number of ingredients within, like pork, shrimp, squid, cheese, asparagus, etc). Very generous topping of bonito flakes here. 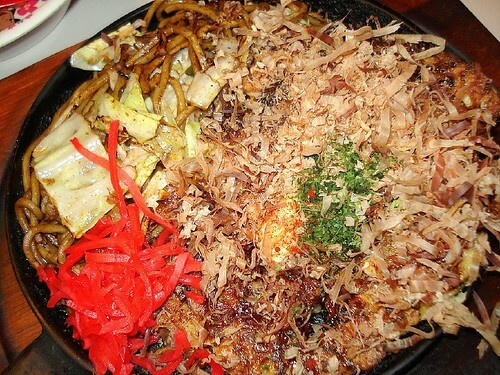 Okonomiyaki-Yakisoba combo on a hot skillet, originally uploaded by Camemberu. 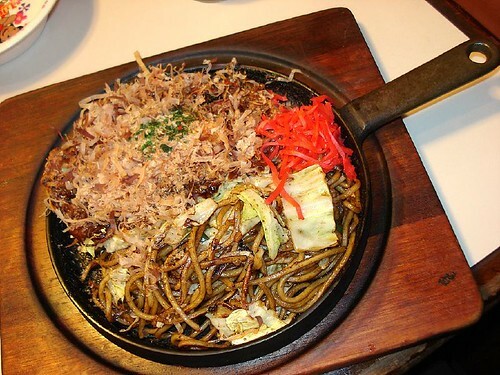 Arrives piping hot on a skillet - the yakisoba is well-charred (but not burnt) in some places, giving it a slightly crunchy bite. I must say I quite enjoyed the dish, it did taste a lot better than it looked. Wish we had our separate portions instead of sharing. Onigiri that's part of the set meal, originally uploaded by Camemberu. We took the "lunch set" (I think only about ¥790) although it was dinner time. It gave us the okonomiyaki-yakisoba combo with a couple of onigiri (rice balls) and hot miso soup. 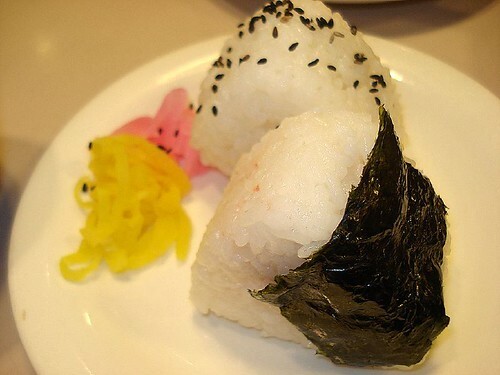 The onigiri was a bit too mushy for my liking though. 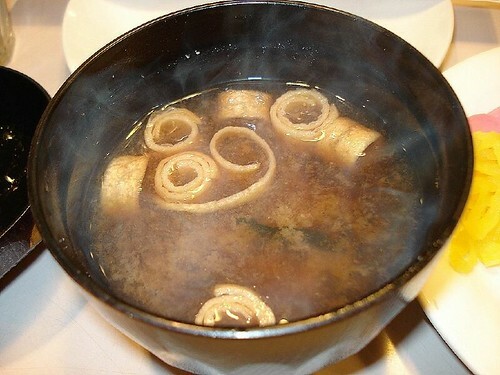 Hot tofu skin miso soup, originally uploaded by Camemberu. This was nice and comforting. Heck, after a long day like our first in Kyoto, anything was nice and comforting. (Kyoto's city area itself surprisingly turned out to be quite ugly and underwhelming). Mr Young Men in Teramachi, Kyoto, originally uploaded by Camemberu. 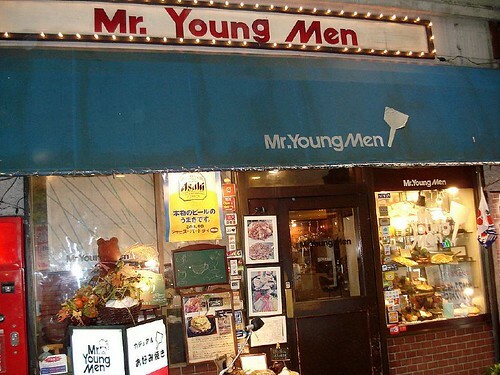 We found Mr Young Men right at the entrance of the Teramachi covered shopping alley near the Shijo-dori side. They're actually listed on the Wikitravel Kyoto page. It's a small joint, so don't expect much in terms of ambience. Just somewhere casual and fun in spirit. Overall fairly inexpensive.